We bring stability and purpose to people who are homeless. In 2018, The Kitchen, Inc. housed 593 people including 98 families with children. More than 40 percent of people we served were under the age of 18. Housing is the key! Your donations make it possible for us to continue the fight to end homelessness. Whether you give money, food, clothing or household items, you are helping people move forward in their lives. Help us build a pathway to ending homelessness by purchasing a commemorative brick to be laid at the new O’Reilly Family Campus. You can honor or memorialize a loved one with your gift. Your gift lays the foundation for a stronger community and helps us reach our initial construction goal by November! If you are facing the possibility of becoming homeless, asking for help is the first step in your journey. Our staff work hard to provide support for your individual needs helping you achieve stability. You can help end homelessness. By giving your time and talents, you can be part of the solution — helping provide savings for our community and dignity and compassion for our neighbors in need. When you first meet Michael Wright, the first thing you notice about him is his tenacity and straightforwardness. He is willing to tell you anything you need to know and isn’t afraid of going for what he wants. Michael, or Mike as he likes to go by, is an Army Veteran who has come a long way in his life. 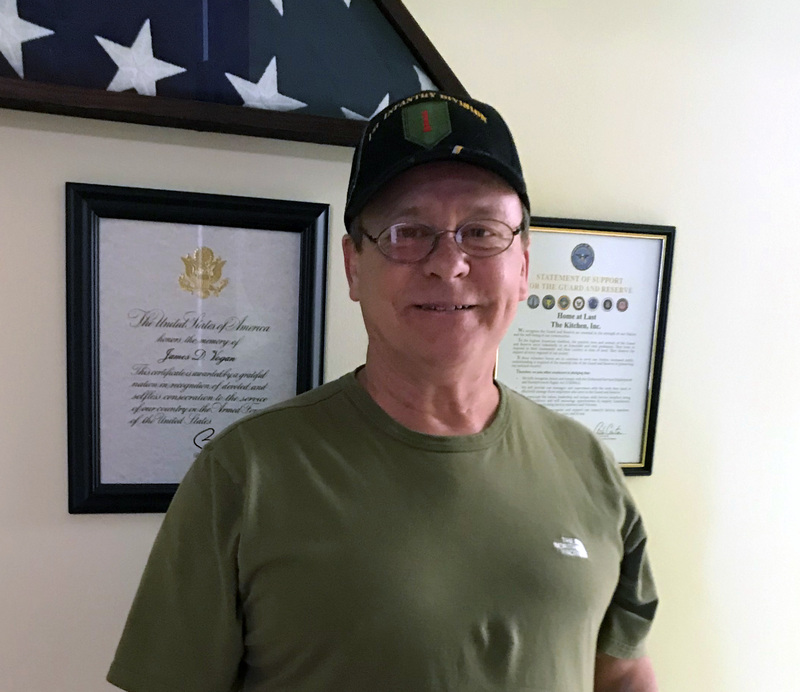 Mike joined the Army in 1976 at the age of 18 because he wanted to do something different with his life. He served in the 1st Infantry Division until 1979 when he was honorably discharged from his communications post. He began working the construction trade but eventually got mixed up in drugs. He was arrested in 2009 for conspiracy to manufacture methamphetamine and sent to prison for 5 years. On his time in prison, Mike states “it made a believer out of me…..prison saved my life.” He quips that since his release, he has shaken hands with the officer that arrested him and thanked him for changing his life. After he was released from prison, Mike was sent to Alpha House, a local halfway house for recently released inmates. Alpha House is where his life began to change for the better. His case manager there told him about a new program called Home at Last that was housing Veterans in the community. With his time almost up at Alpha House, he stopped by The Kitchen, Inc. to see what the program was all about. He became a part of the program in April of 2014 where he began to work with his case manager, Kendall McDaniel, to locate housing. Mike used his tenacity to locate an apartment at a local complex by going himself and talking to the landlord. “I just went to her and told her I had been in prison and why and asked if she would take a chance on me” he reflects. He was housed in September of 2014 and was given furniture and food to start him out. But his gumption to change his life did not stop there. Part of his housing plan was to find employment, which can be difficult for someone with a felony. He employed the same strategy he had with looking for housing and went to an interview at Whole Hog Café. He told the manager that he had been to prison recently, but was trying to change his life and asked for a chance. He gained employment at Whole Hog! He exited the program in 2015 and since then, he has moved to a bigger apartment within the complex and remains employed at Whole Hog Café. He even bought himself a car, which he is making his last payment on next month. But Mike, being the humble man he is, gives credit to Home at Last for helping him in his journey. “I wouldn’t have been able to do all of this without you guys here” he stated with a smile on his face. Mike is a true testament to how the mistakes you make in your life do not define who you are or where you go. When asked what advice he would give to another Veteran in the Home at Last program, Mike says “Follow what they want you to do…if they tell you need to do something, it’s because it will help you in the end.” His former case manager, Kendall, had this to say about Mike “The program worked so well for Mike because he really wanted to work at it and make the changes in his life to get where he is today. Michael was an exemplary client, and a perfect example of how the program is supposed to work. When Mike first came to us he had absolutely nothing; no house, no job, no money, no car, no healthcare, no income, literally nothing but the clothes on his back; and with serious health issues, and just exiting the prison system to boot. Some pretty serious barriers. Mike succeeded because he was determined that he was not going to fall into the lifestyle of living on the streets. Today he has a car, steady employment, stable housing, money in the bank, VA healthcare, and his life is on track.